Located in Downtown Richmond, this hotel is within a 10-minute walk of VCU Institute for Contemporary Art and Altria Theater. Greater Richmond Convention Center and Stuart C. Siegel Center are also within 1 mi (2 km). Richmond Main Street Station is 23 minutes by foot. 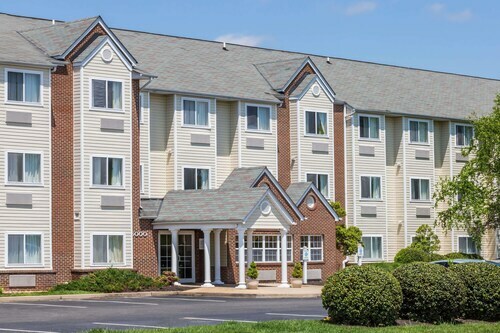 Situated in Petersburg, this hotel is 1.9 mi (3 km) from Dogwood Trace Golf Course and within 6 mi (10 km) of Fort Lee and Old Blandford Church. Centre Hill Museum and Poplar Grove National Cemetery are also within 6 mi (10 km). 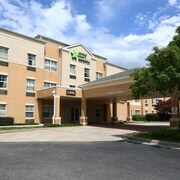 Located in Downtown Richmond, this hotel is steps from Central Business District and Broad Street. Shockoe Slip and The National are also within 10 minutes. Richmond Main Street Station is 8 minutes by foot. 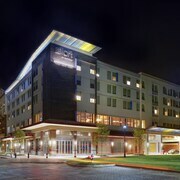 Situated in Richmond, this hotel is within 6 mi (10 km) of artspace, Shockoe Slip, and Blue Bee Cider. Virginia Holocaust Museum and Edgar Allan Poe Museum are also within 6 mi (10 km). 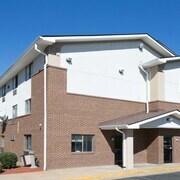 Situated in Hopewell, this motel is within 3 mi (5 km) of Fort Lee, U.S. Army Women's Museum, and U.S. Army Quartermaster Museum. Petersburg National Battlefield Park and Weston Plantation are also within 6 mi (10 km). 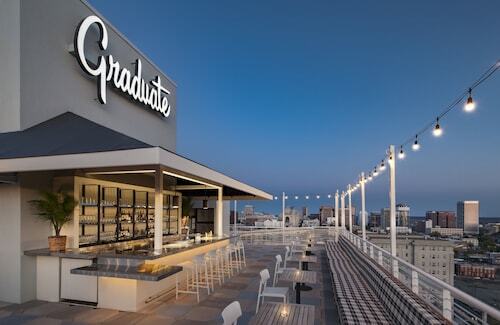 Located in Downtown Richmond, this luxury hotel is within a 15-minute walk of Broad Street, Altria Theater, and Greater Richmond Convention Center. The National and Richmond Coliseum are also within 1 mi (2 km). Richmond Main Street Station is 21 minutes by foot. 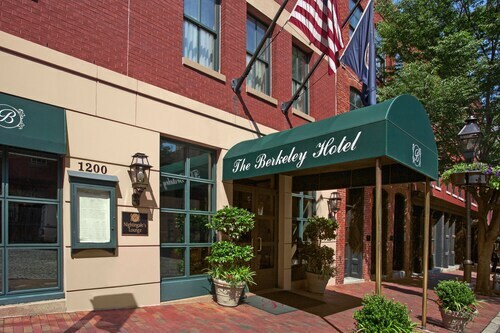 Located in Downtown Richmond, this romantic hotel is steps from Central Business District and Shockoe Slip. Broad Street and Virginia Commonwealth University are also within 10 minutes. Richmond Main Street Station is 8 minutes by foot. 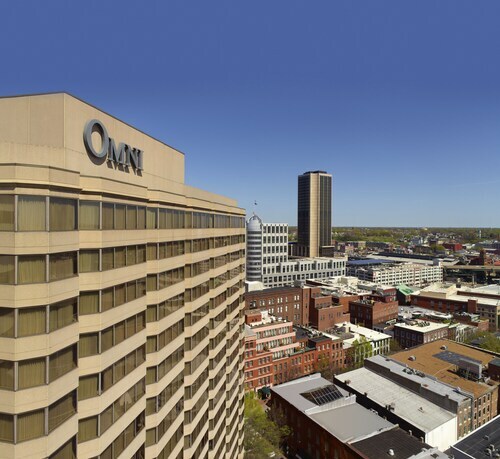 Located in the cobblestoned Shockoe Slip district, Omni Richmond Hotel is an 8-minute stroll from Virginia State Capitol and Governor’s Mansion. It’s a 15-minute drive from the hotel to the historic landmarks of Monument Avenue, and 7 minutes to Hollywood Cemetery. Located in Downtown Richmond, this hotel is within 1 mi (2 km) of Greater Richmond Convention Center, Altria Theater, and Edgar Allan Poe Museum. St. John's Episcopal Church and Virginia Capital Trail: Richmond Trailhead are also within 2 mi (3 km). Richmond Main Street Station is 15 minutes by foot. 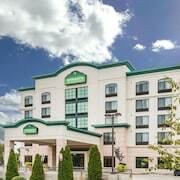 Hotels in Richmond start at $44 per night. Prices and availability subject to change. Additional terms may apply. The afternoon sun warms your body like a glass of fine whiskey as you stroll along the avenues of Richmond, Virginia’s historic downtown. The cobblestone streets running through it may lead you to think this is a place that time forgot. But time has not forgotten this Southern Belle. It has grown with passing years just as you have—matured, if you will. Building upon its principles the way you have throughout your own existence. The growth this town has experienced in the last decade—let alone since its founding—has been exponential. From the growing craft beer scene to the food tours through the area’s different neighborhoods, there’s no shortage of things you must do and see. And when you’re wondering where to stay in Richmond, Travelocity is your guidebook to the best places to stay in Richmond. Hyatt Place Richmond Airport: This is your best bet, wise wanderer, if you’re looking for easy access to the city itself and the airport. Located within a stone’s throw of Richmond International Airport (RIC), the Hyatt Place is ready to make your trip both relaxing and convenient. Keep in touch with business partners or friends back home via the hotelwide Wi-Fi, and enjoy a delicious meal every morning at the hot buffet. You can relax in your hotel room waiting for your meeting or flight, or you can step outside and enjoy some of the nearby amenities. 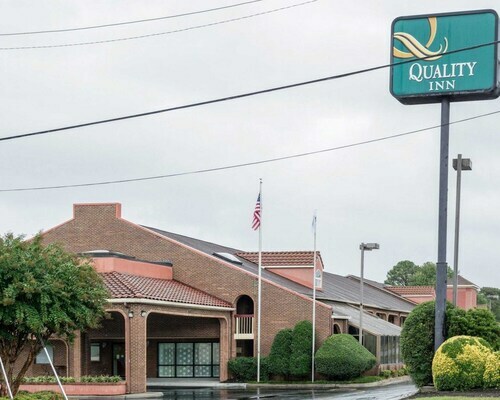 The venue is situated in White Oak Village, which is home to numerous restaurants and stores; pick up that oh-so-necessary souvenir for your children, or do a little window-shopping to pass the time before your flight. We know you like we know ourselves—and we love spending time in the bustling downtown district. Glide through the Virginia Museum of Fine Arts and summon your own creativity. Spend some time at the Lewis Ginter Botanical Garden and see how many different types of flora you can count (hint: over 50 acres worth). And of course, there’s the sheer majesty of the Virginia Capitol Building. 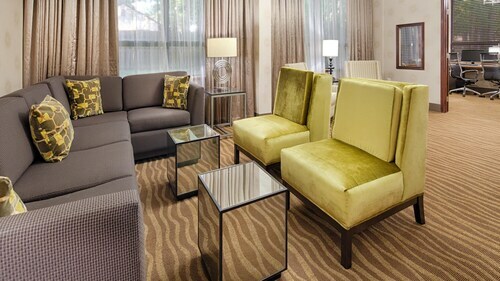 Crowne Plaza Richmond Downtown: Within easy reach of numerous attractions, Crowne Plaza offers a number of amenities to help you recharge at the end of a long day of work or play. Enjoy a vigorous workout at the on-site fitness center, or find peace in the water by swimming laps at the indoor swimming pool. Sample a tasty dessert at the Pavilion Café, or order up morning coffee from room service. Tailor your stay exactly the way you like. 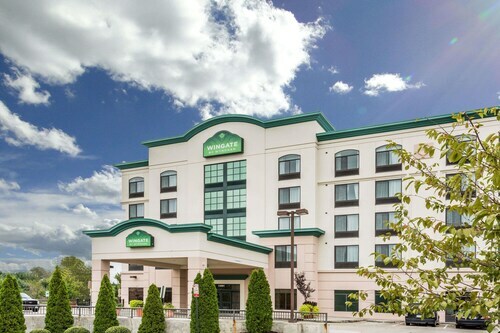 Hilton Richmond Downtown: This convenient hotel provides an excellent place to relax and regain your energy after a day spent exploring the city. Spend a few hours people-watching in the lounge, or get caught up on that important project in the hotel business center. Everything you need will be right at your fingertips, whenever you require it. Perhaps you’re no stranger to the finer things in life. You only sleep between sheets of the highest thread count, and demand a certain level of service from staffers. Traveler, look no further: we have exactly what you need. Omni Richmond Hotel: Your trip to Richmond is adventure enough on its own, but it will reach new heights at the Omni Richmond Hotel. Indulge in a delicious meal at Trevi’s Grille, followed by a sweet vintage at its accompanying lounge. No pleasant day is complete without a swim in the pool and an hour of sunshine out on the deck. Wanderlust: you know it well. The need to travel and explore flows freely through you, like a bird riding a breeze. You’re wondering where to go and what to do when you get there. 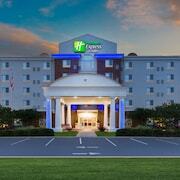 Travelocity thinks your travel plans should include a stay in the capital of Virginia. 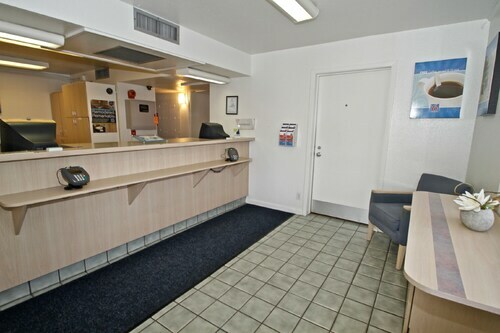 Trust us to secure you the lodging you need at a price you can afford, whether you’re after a luxury stay in the heart of downtown or are just looking for one of our cheap hotels in Richmond. Whatever you need, we can help you obtain. Book your accommodation today and begin your journey tomorrow. Now lift your whiskey in a toast to the travel gods—you’re off on your next adventure! Beautiful property, and the service was excellent. Best breakfast coffee ever. Staff ranks in top for friendliness!! Enjoyed breakfast, but my favorite part was the L shaped couch in our rooms which we used for a family setting ( we had 3 rooms altogether. The front desk setup was unique and works. 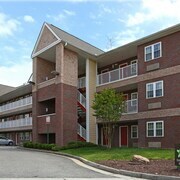 Convenient location, quiet, and appears well-maintained. Convenient to the highway and clean. Plenty of hot water and breakfast was nice. I was a but worried after reading some reviews, however some people just cant be pleased. Was this the cleanest hotel ive ever stayed in,no, was i worried about my health, absolutly not. Staff was pleasant, even had a few laughs. So, if you are a nice person and are not hard to please, this hotel is just fine.